You may not know that she overcame formidable difficulties like lack of education and being completely overwhelmed by domestic responsibilities as a young girl, and as a young wife…to become the most prolific newspaperwoman of her day. Despite all opposition (including destruction of her writings by family members) she brought all her dreams to fruition with hard work (and perspiration), unwavering self-belief (and imagination, and a mountain of courage (or ‘true grit’). She founded a periodical newspaper, produced entirely by women, and devoted much of its content to the fight for women’s rights. Hers was amongst the loudest of the written ‘voices’ of Australian suffragettes. I tell you all this because I have been awarded a Purple Star for my Squidoo lens about Louisa Lawson, and I feel SO proud to be following the path she and other courageous women like her paved to enable us all to live our dreams…if we want them enough. 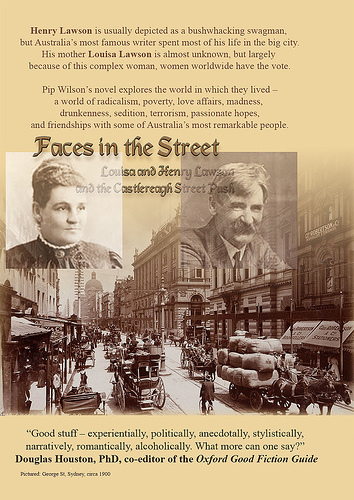 Henry’s Mother – Louisa Lawson – and if you don’t know what a Purple Star is awarded for, click on the one next to the title, on the actual article.